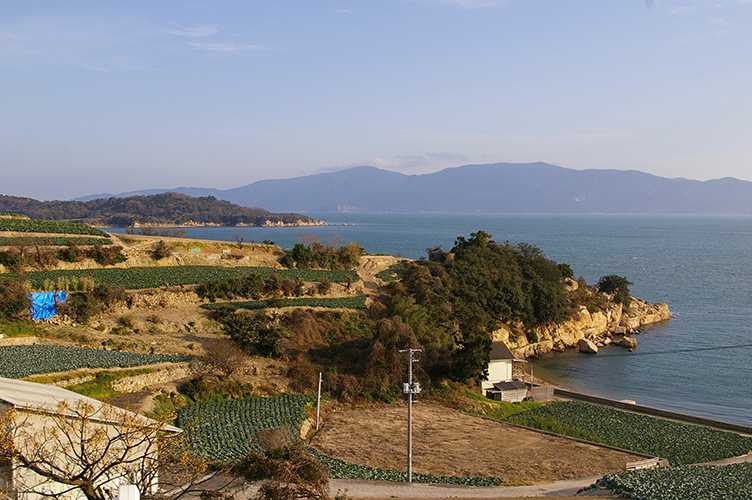 At the end of March 2016, an unveiling ceremony of a memorial monument erected on a small island of the Seto Inland Sea took place. Roman letters were handwritten and hand-carved on the stone. This may have been the first time in Japan that anyone had undertaken both of these tasks. 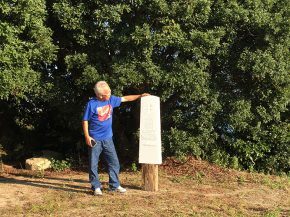 This two-part article is about a monument, which came about from my personal wish, was realized by the support of many people, and finally put up as a public monument. I hope you will enjoy reading through both parts of the article. 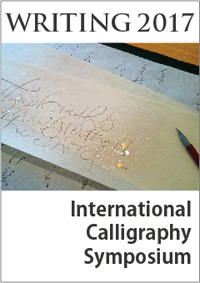 Letter cutting of Roman letters was introduced to Japan in October 2009. 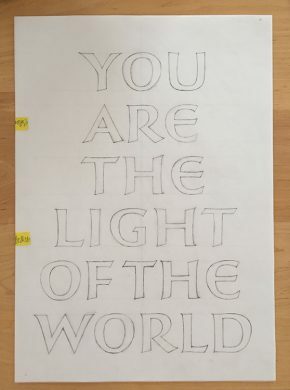 J-LAF invited Emi Gordon, a letter cutter living in England, to be the instructor for a series of workshops. 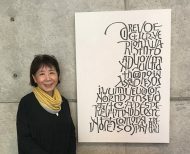 I was a student from the very first one, and from then on, I applied myself to letter cutting using all my knowledge and technique acquired from many years of being a calligrapher. In the course of drawing letters, carving, and introducing my work, I began to dream vaguely of one day creating a monument. 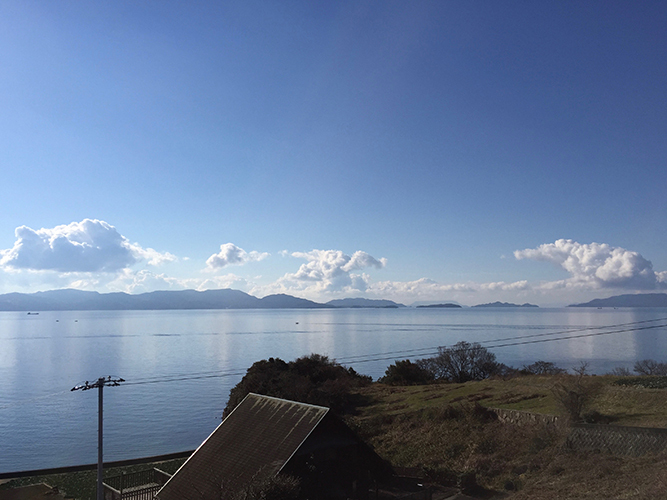 We kept the house in Maejima after my father passed away, but my mother lived with my youngest sister in Kobe, which is close to where I live. 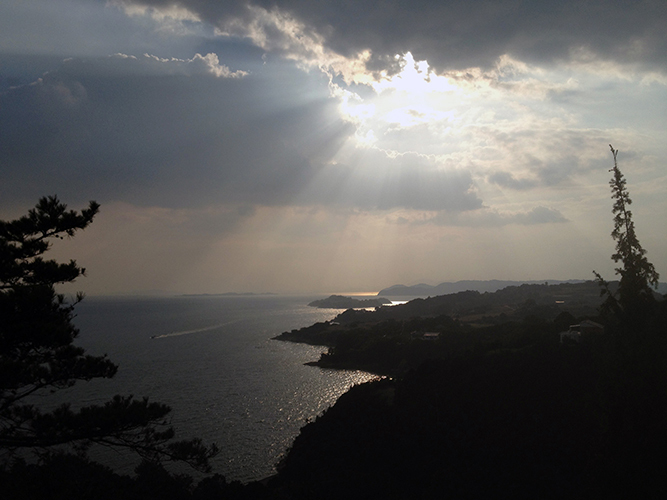 My mother and I began making trips to Maejima once or twice a month. 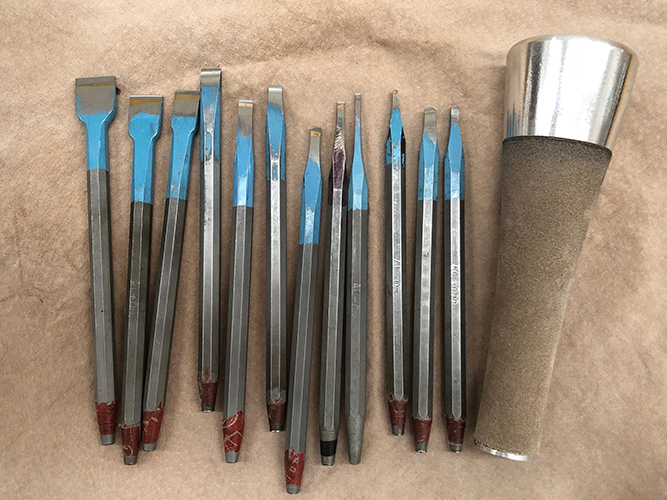 J-LAF was planning to a hold letter-cutting exhibition in Osaka and Tokyo in the fall that year, so my visits to Maejima became valuable opportunities to work on my letter cutting and also to try to find a way to realize my goal. 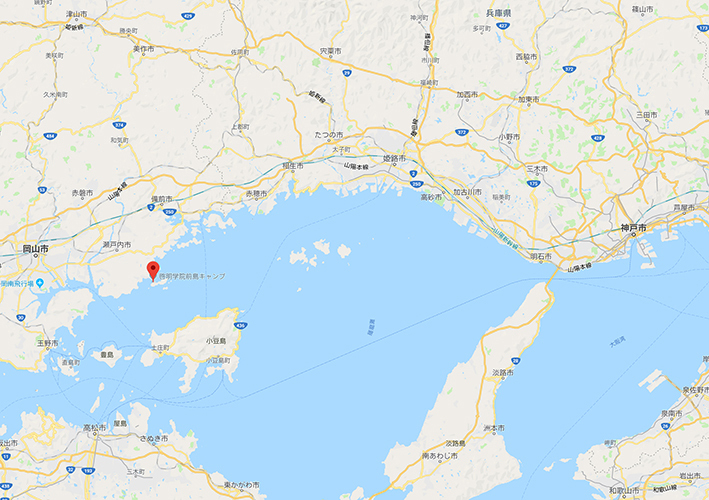 The island where my parents lived for 24 years and where my father held dear to his heart, is located right in front of Ushimado Port. Famous for its beautiful sunsets, its scenery has been used in several commercials or television dramas in recent years. With a population of just under 150, many people make a living as farmers. On holidays and during high seasons, visitors flock to the island to enjoy activities on the beach or to go fishing, and they stay at guesthouses or B&B's. 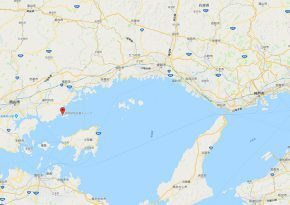 The answer to the question I had been asking myself as to the location of the monument was of course Maejima, and as for the rest of the answers, my search continued as the faint memories of my parents' everyday life on the island kept coming back to me. I knew from my past experience of creating something that I would eventually and inevitably reach the best answer possible, so I felt fortunate that I had time to ponder. Summer came, and it was then that I remembered something important. Looking back, I don't know why it didn't come to my mind much sooner. 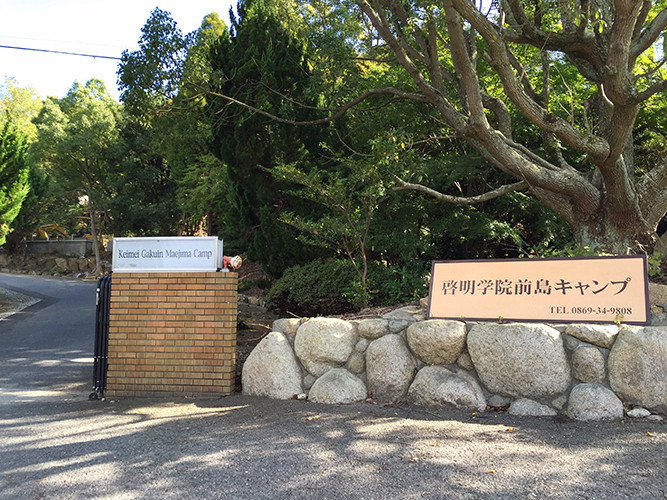 Incorporated School of Keimei Gakuin owns Maejima Camp on the island. 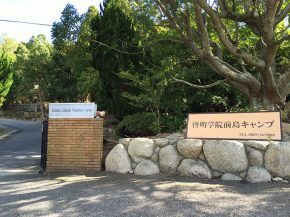 Keimei Gakuin is a Christian coeducational junior-high and highschool in Kobe, and every spring and summer, the students enjoy the rich natural environment of Maejima engaging in outdoor activities that are not available in classrooms in the city. 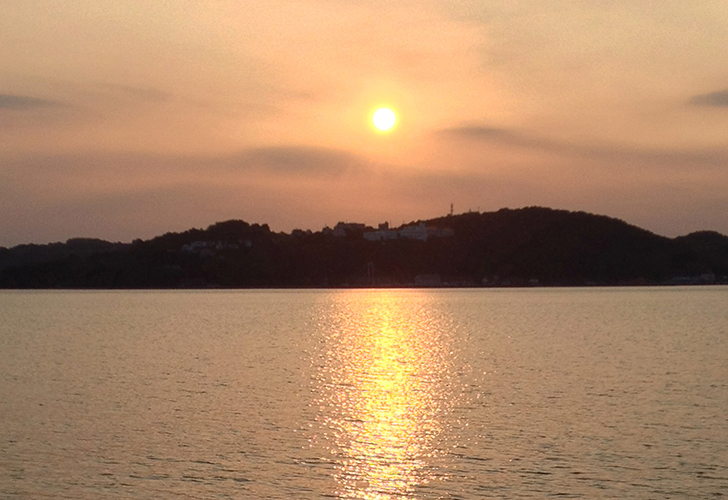 It was in August 2014 when my father was still living on the island while fighting his illness. I was staying at my parents' home hoping to be a help with his battle. I was also hoping to carve stones and take a photograph of one my works to use on a postcard announcement of an exhibition I was planning with a friend in the fall. I asked my father if he knew a place that would make an ideal background. He proudly replied, "There's an absolutely beautiful location－a place I love." He took me to this place, which had a glorious view overlooking the ocean. This was an outdoor chapel called the "Hill of Prayers" located inside Maejima Camp. I suddenly remembered this in the summer of 2015. 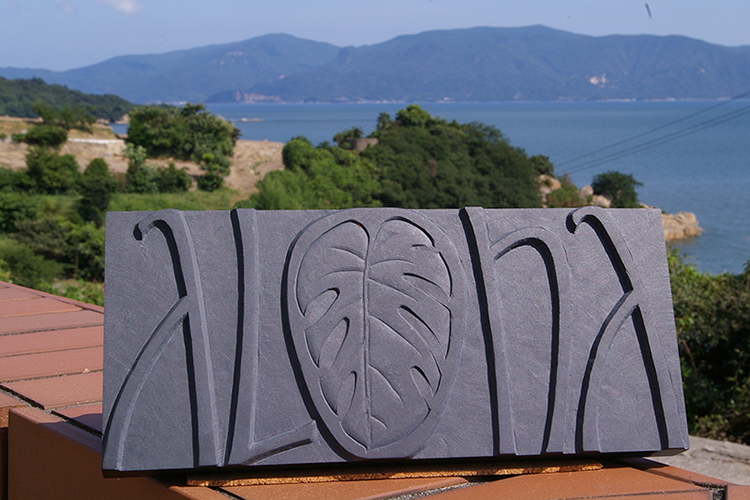 What I had taken a picture of there was a stone shaped like one of the Setouchi islands on which I had carved the word "remembrance". The moment I remembered this, I was so surprised to realize the coincidence that the word that I had chosen to carve on the stone back then had been an English word meaning "memory or something that serves to bring to mind". I finally came to the conclusion that there is no other location ideal for the memorial than the Hill of Prayers in Maejima Camp, and I am sure that my father was by my side having a laugh and whispering, "It's about time!" As if a barrier preventing the flow had been removed, I suddenly began to also remember how my parents were connected with Keimei Gakuin and relevant people. I could not help but think that there is a "right time" for everything, and this was when everything started to move forward. 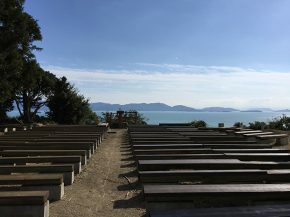 The image of the Hill of Prayers and the presence of Keimei Gakuin led my smooth preparation for presenting the idea, and on September 24, I was in Maejima with a rough sketch and project proposal for the memorial. 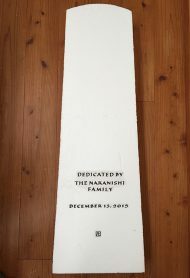 I met with Mr. Yoshihiro Ikushima, who manages Maejima Camp, to ask him about donating a monument. Mr. Ikushima made a call to the then-President of Keimei Gauin, Mr. Hachiro Ozaki, on the spot, and I was able to meet him the next day. 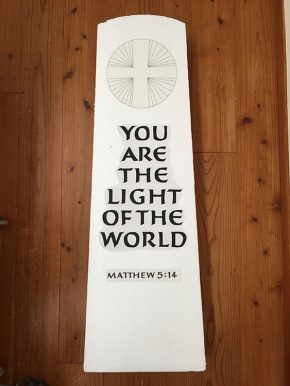 With a huge smile, Mr. Ozaki readily agreed to my proposal for a pure-white marble with an inscription "You are the light of the world" (Matthew 5:14). 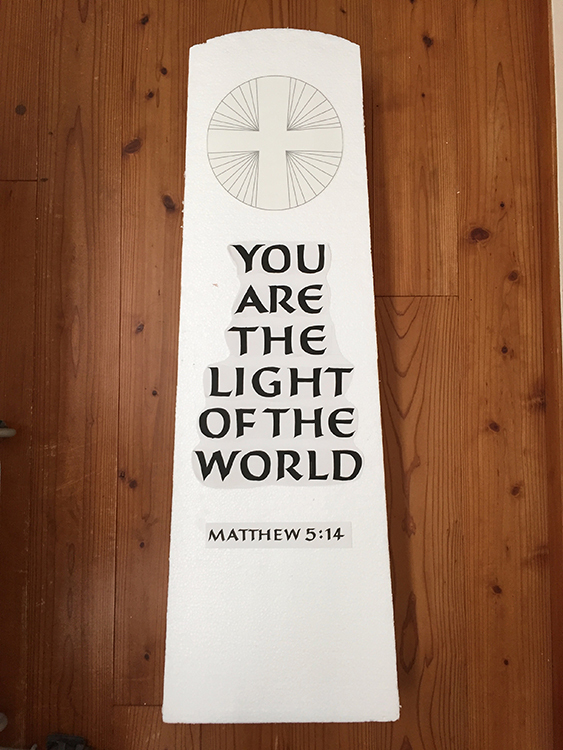 I had not made a concrete request as to the place where I wanted the memorial to be installed, but I was thankful when he suggested a few days later, "How about the Hill of Prayers?" Now it was time for the important arrangement for actual letter cutting. 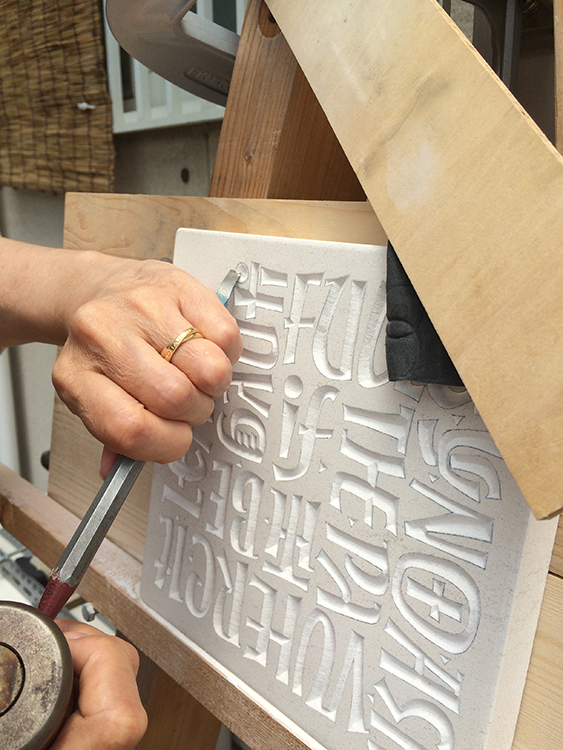 Until then, I had been carving on a stone of a size that I could easily carry around. 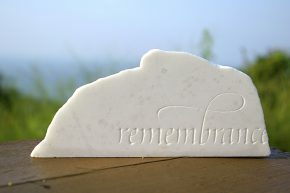 I had no knowledge based on my own experience about deciding on a shape, size, weight for a much larger memorial. From looking through books on letter cutting and available images on the internet, I decided on a shape and an idea of the weight as "something that a few men can carry", and drew up a rough image. 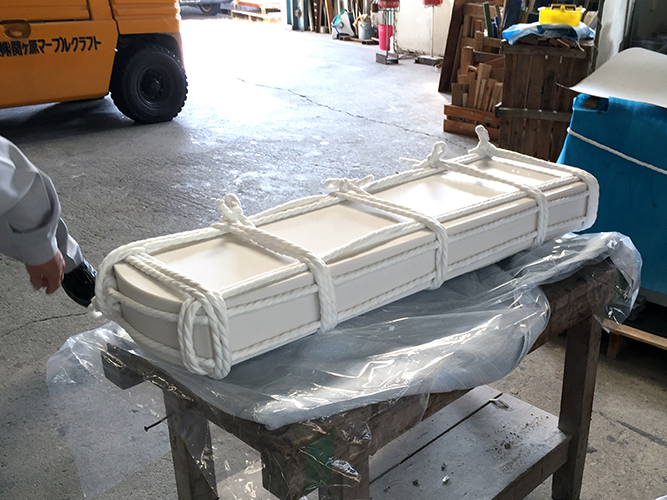 On October 1, I visited a stone company in Sekigahara (Gifu Prefecture). It is two hours away by car, and by no means a neighbor. I came to know about this company during my visit to Mount Ibuki, which I decided to visit after hearing that it was all made up of limestone. On my visit, I happened to see a sign that said "Sekigahara Marblecraft" and decided to go in. From then on, I had several contacts with the company through purchases or asking for advice about stones. 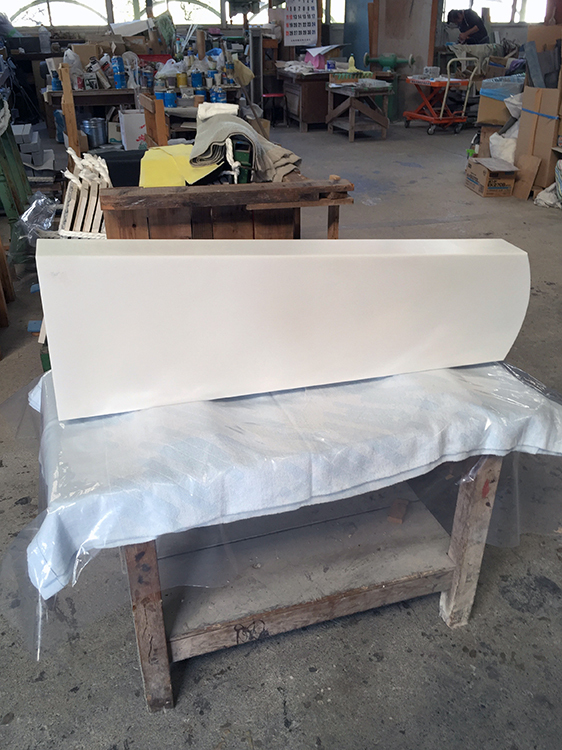 From my experience of letter cutting on several types of white marbles, I selected a pure white marble from Macedonia called Sivec for the memorial. 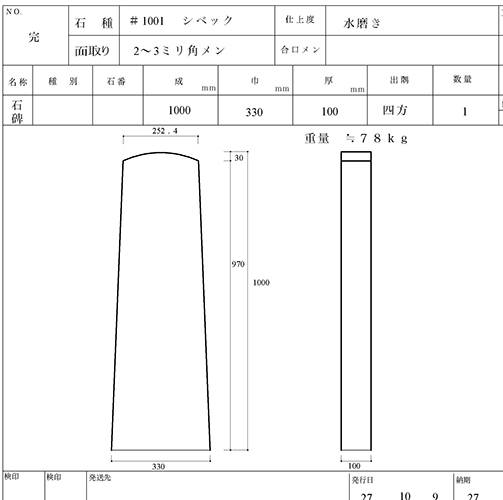 I asked the person in charge for an advice on the thickness of the stone, which inevitably was related to its weight. He immediately calculated the weight of the marble in the thickness that I hoped for, and I was relieved to find out that it would be a little under 80kg, a weight that a few men could carry. I was able to order the marble in the size that I had imagined. 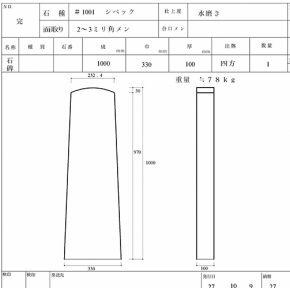 Until the time that the stone would be ready to be engraved, I made an actual-size dummy of the memorial in styrofoam, and took it to Maejima Camp on October 13 to decide on the actual site and the approximate height of the base stone. I also took my "remembrance" stone to check how the shade would look to consider which direction the front of the monument should face. 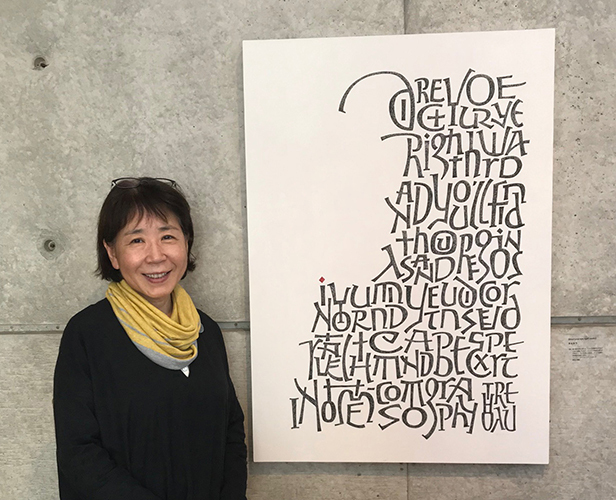 Few days after I returned from Maejima, I replaced the printed letters that I had stuck on the dummy with letters handwritten with an edged brush, and visited the president of Keimei Gakuin in Kobe. The date just happened to coincide with the worship service for the 92nd anniversary of the founding of the institution. My mother and I went to the service held in a large gymnasium, and the President introduced us to the students, parents, and faculty, and told them about our donation of the memorial. On the very same day, he also suggested that the date to be inscribed on the back of the memorial to be the 92nd anniversary date of the school's establishment. While I started this project to commemorate my father's life, I had wondered on what grounds I should choose the date to carve on the stone. 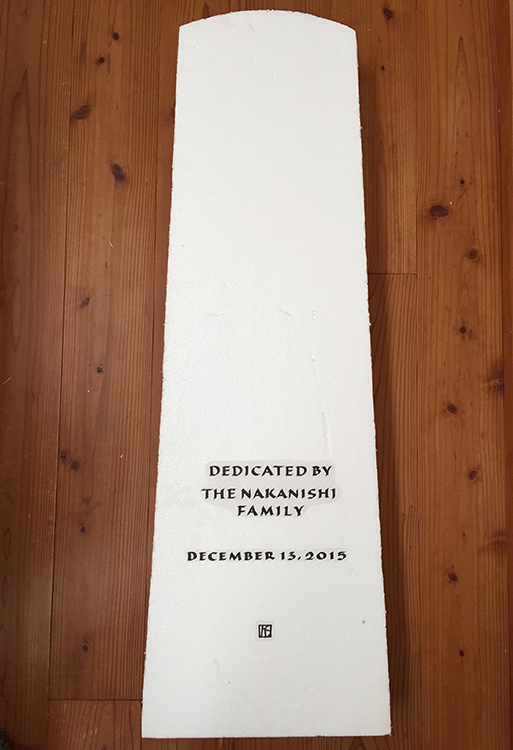 President Ozaki had placed the last piece of the puzzle. 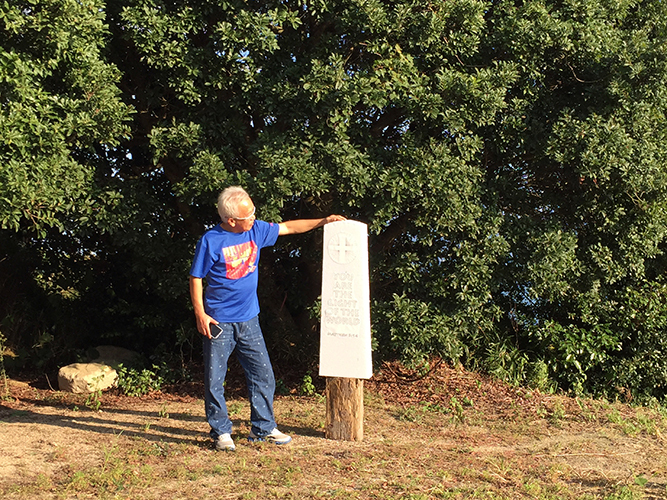 Using a dummy to consider the location and height of the memorial with Mr. Ikushima. After this picture was taken, trees in the background were thinned. a bit, and Hiroko Shimizu's mark removed. 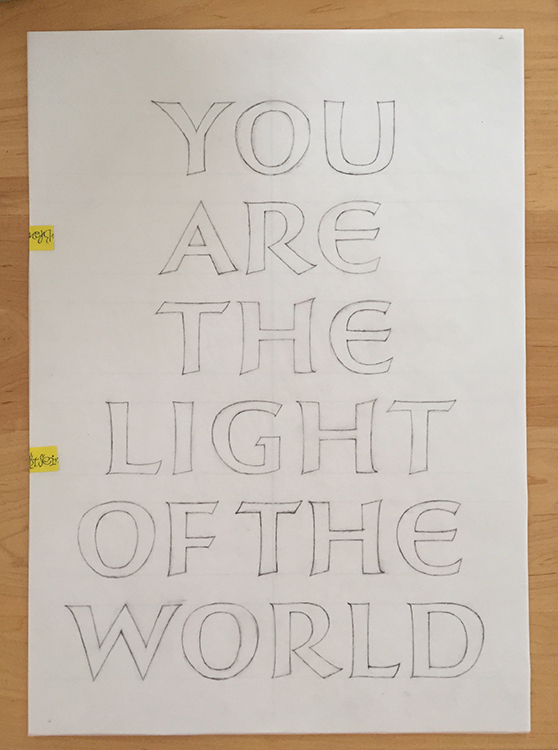 The final preparation was proceeding steadily with the final drawings made from the edged-brush lettering for the front inscription and the back inscription with the donors and date. 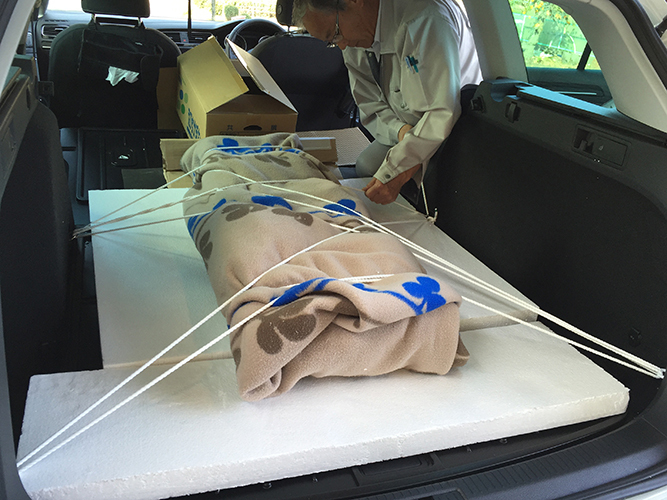 On October 23, three weeks after placing my order, I headed for Sekigahara to pick up the stone. As I watched the employees of the stone company carefully tie, wrap and secure it in my car, I was feeling elated that I was finally taking the next step.